Ed Wechsler, owner, La Mer Seafood, also actively caters for diffferent events. 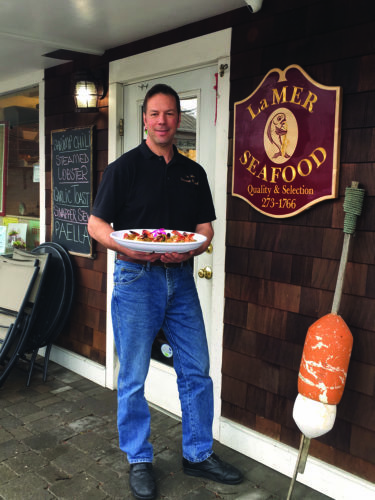 Almost three decades ago, Ed Wechsler opened La Mer Seafood on Main Street in Armonk. At the time he was 22-years-old, already armed with a wealth of experience from working in top epicurean stores in surrounding towns. 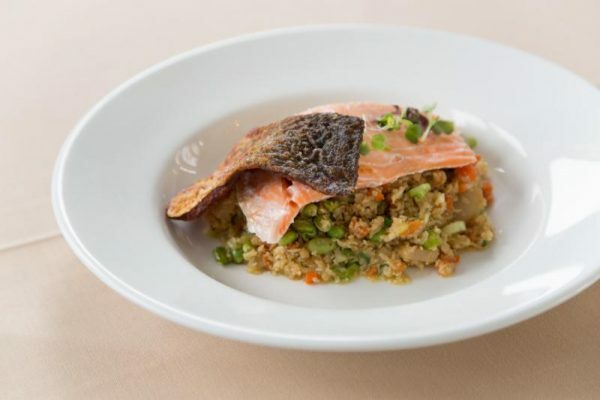 Back then, he focused mostly on fish but as lifestyles changed and consumer demand for organic foods skyrocketed, La Mer Seafood evolved and today it offers full service catering and mostly wild caught organic, locally-sourced fish. Being in business for so long, Wechsler knows his customers and his fish. 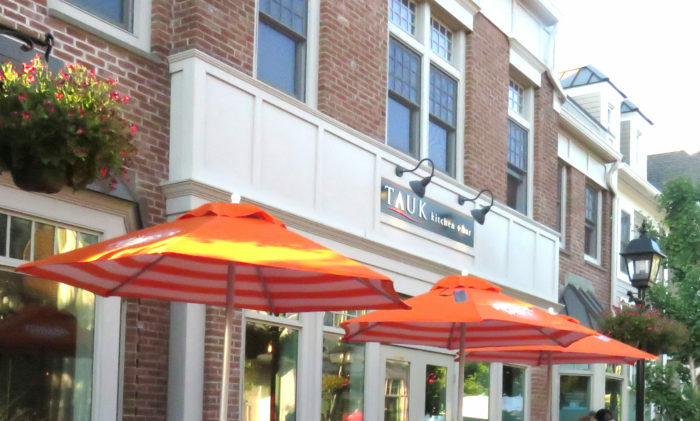 While Inside Armonk was in the Cape Cod nautically-inspired store, a customer walked in for lunch and asked for “the usual.” A few minutes later, he walked out with a homemade soup and lobster roll featuring fresh Maine lobster caught daily. 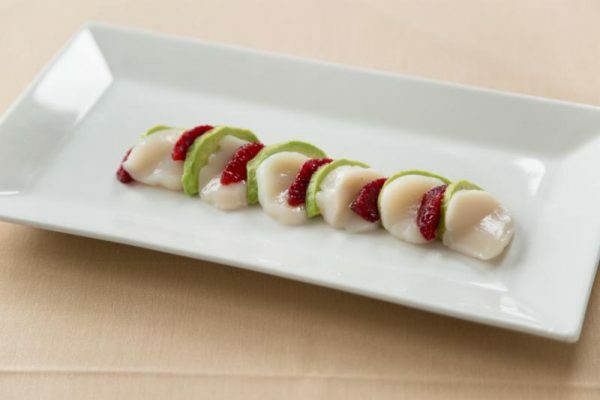 With summer approaching, Wechsler and his team are at the ready preparing clambakes, lobster bakes and elegant hors d’ouvres, buffets and barbeques for pool parties, graduation celebrations and even weddings. Wechsler prides himself on choosing only the most friendly and courteous staff for set up, serving and preparing the food and clean up. 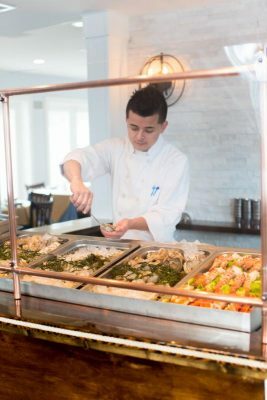 In the past few years, La Mer Seafood has expanded its catering services and he now is busy year round with holiday parties and corporate catering events. “We do a lot of cocktail parties, office parties communions and Bar Mitzvahs mostly in people’s homes. 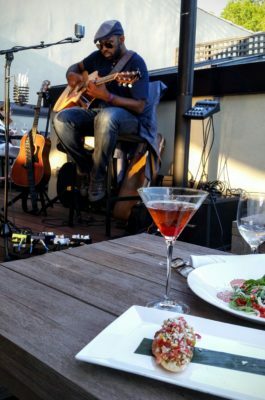 We supply the staff, the rentals, bartenders and everything is prepared from scratch and as healthful as possible.” La Mer Seafood also has partnerships with area caterers by providing seafood for En Vious Events and Culinary Angels, among other endeavors. In addition to lunch and dinner specials, the “take and bake” option is also very popular with customers these days who are short on time. The staff will season the fish for you, place it in a small tin and then all the customer has to do is bake it in the oven. Wechsler is all about making the customer’s life easy and provides one-stop shopping with breads and other produce available at the store to round out a complete dinner. 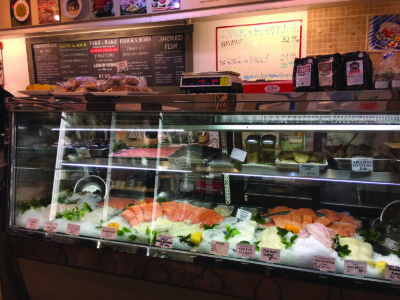 It’s no coincidence that Wechsler is known as a “fishmonger extraordinaire.” He has intimate knowledge of every fish that is sold in his store. The fish is bought at the Fulton Fish Market (now located at Hunts Point in the Bronx) and his buyers get there early to get the very best selection. He is also a veritable wealth of nutrition information on virtually every fish in his store. Wechsler prides himself on knowing where it was caught and how it was caught (wild versus farmed). He knows about fish farming techniques, mercury counts and use of pesticides in farmed products. Fish that is farmed outside of the US, Canada or Central America has different safety regulations and is often laden with pesticides and antibiotics. That’s why Wechsler prefers wild caught, and if he is going to purchase farmed fish, he prefers to buy organic. What Makes a Dining Experience Memorable? What Doesn’t? 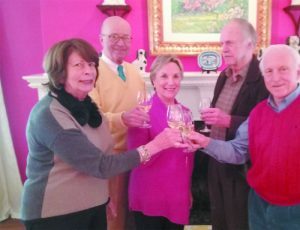 “An ardent or refined interest in the dining experience,” defines a foodie and surely applies to the membership of our gourmet group, who I recently surveyed to get their opinions. Wright Elliott has brought a sophisticated palate and passion for food from his native New Orleans. 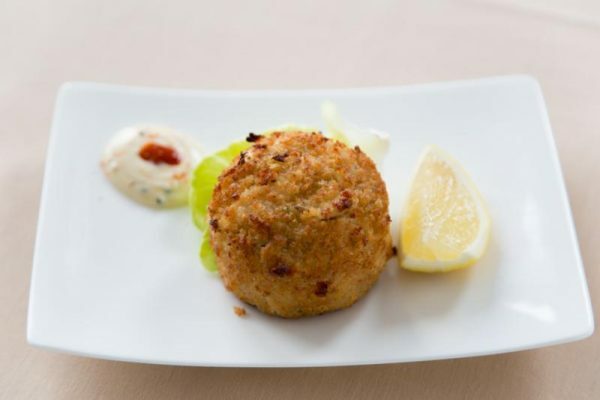 Wright’s many talents include a recipe for jumbo lump crab cakes honed to perfection over many years from when he owned a house on Maryland’s Eastern Shore. 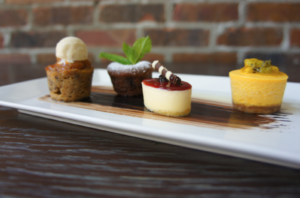 Art Nagle brings expertise in finding the freshest and highest quality ingredients, and on the visual aspects of food presentation, he is most certainly a perfectionist. Eating out is indeed a special occasion for these men, because they have high standards when cooking at home. Both believe that restaurant food should be original and memorable, prepared by a chef who takes a personal interest in customer satisfaction. 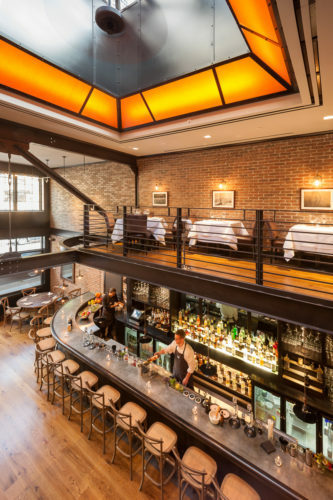 Farm-to-table ingredients and quality (or the seafood equivalent) are high on their list, and they tend to seek out restaurants that are building this concept into their menu options. Service is very important too. Beautiful food, beautifully served is 90% of a “memorable dining experience” in Wright’s opinion, and Art adds that he also wants the host or hostess to be friendly, along with the wait staff. As wine connoisseurs with large personal wine cellars, both Art and Wright look for moderate to expensive offerings, as well as esoteric wines from different areas like Sicily or Greece, if these selections seem more appropriate. They like to be able to consult a sommelier or resident wine expert, as restaurant wine lists rarely provide sufficient detail about their choices. To sum up a positive dining experience, both men like to go first class, and don’t mind paying a premium for good food and service. The two ladies from our group, Judy Foley and Paige Nagle, are excellent cooks in their own right, and have high interest in seasonal menus with a good balance of flavors. They too look for creativity and, even if premium priced, the menu has to have a Wow factor to it. Judy and Paige both stress service, cleanliness and ambience to make for a “memorable dining experience.” They like it when the chef comes out at the end of a meal to inquire how your dining experience was, and a warm and inviting atmosphere with pretty flowers and tablecloths on the tables is a plus. Poor acoustics and noise top the list, as all of them want to be comfortable and able to carry on a conversation with their fellow diners. Hovering service or, on the other hand, slow service, are frowned upon. No one enjoys that moment when the second you put your fork and knife down, the plate is whisked away; you feel like you are being deliberately rushed. Overly large portions is a no-no, especially with the ladies. Overly small servings of wine are not a very hospitable gesture and can be especially annoying. Another pet peeve is a “No Reservation” policy -– no one wants to run the risk of a lengthy wait the next table. Restaurants should take reservations no matter how many people arrive with the party of diners. 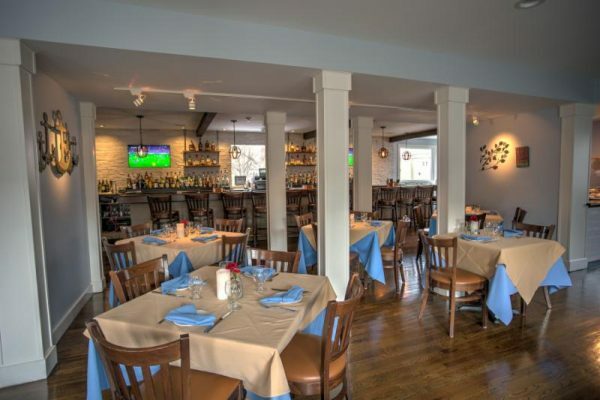 To create a positive dining experience for his customers and to attract new customers, a local restaurateur hired a new chef and added high quality seafood at affordable prices with great success. He believes that cleanliness and ambience are the ultimate expression of hospitality. Karen Talbot is a Westchester-based personal shopper and restaurant reviewer. The love of cooking runs in her family! Karen’s son Alex and his wife Aki Kamozawa have just opened “Curiosity Donuts” in the Stockton Market in Stockton, New Jersey.